Morocco and the United States are committed to fighting terrorism, Ambassador Nathan Sales, U.S. Coordinator for Counterterrorism, said Thursday in Rabat. “The commitment shared by the government of Morocco and the United States to fight and defeat terrorists is at the heart of a strong Moroccan-American partnership,” Sales pointed out at a press briefing following talks with Morocco’s Foreign Minister, Nasser Bourita. “Terrorist groups like ISIS and Al-Qaida continue to threaten and unite us in our determination to fight this scourge,” he was quoted by the Moroccan news agency MAP as saying. 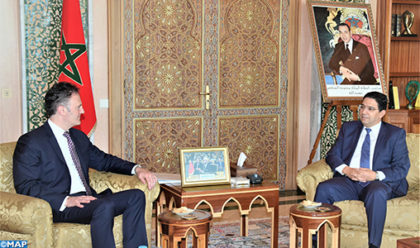 The U.S. official who described his talks with Bourita as “productive”, praised the “excellent” friendly relations between Morocco and the United States and the two states’ alliance to fight terrorism at the bilateral level and also in the framework of the Global Counterterrorism Forum (GCTF), co-chaired by Morocco and the Netherlands. Sales also expressed Washington’s wish to step up this cooperation further in the future. At the regional level, the development of counterterrorism capabilities and cooperation in the Maghreb and Sahel regions is at the heart of Moroccan-American partnership in this area, with a view to strengthening security and stability in the region, said Ambassador Nathan Sales who has just visited Tunisia and Algeria part of a Maghreb tour August 26-30. At the multilateral level, the two countries are cooperating more intensively, notably within the framework of the GCTF, under whose auspices Morocco is jointly leading three initiatives, on border security, the fight against homegrown terrorism and the Initiative on improving capabilities for detecting and interdicting terrorist travel through enhanced terrorist screening and information sharing, MAP noted. This last initiative, which is scheduled to be launched in New York on September 27, is in accordance with the UN Security Council Resolution 2396 that deals with the threat posed by foreign terrorist fighters, especially those returning from conflict zones.